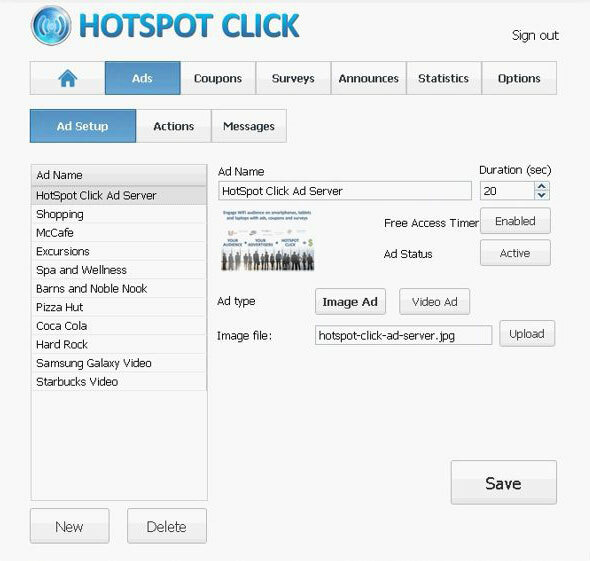 How to configure Ads in HotSpot Click? HotSpot Click is an advertising and content server that helps you to display various forms of advertisements within your HotSpot web pages. You can show the ads of your company or third party advertisers, this allows for increasing the revenue by monetizing the promotion of other brands. To motivate the users to watch the ads, you can allow them free (limited) access, after the ad is displayed for predefined amount of seconds. You will keep all the earnings made using HotSpot Click feature, they are not shared with Antamedia company. Pay only once for a lifetime license and use the feature without any limits. HotSpot Click allows you to create image or video ads that can be displayed on desired pages. For example, you can create one or more ads for the login or free access page. A user can be forced to view an ad in order to get the Internet access. If you define multiple ads, they will be rotated each time a user opens the page. Before configuring the ads, you should activate Click engine, please go to HotSpot Setup – Advertising page and enable this feature, then click Save (licensed version) or Start Trial button. Application will start and your default browser will be launched automatically, so you can set up the ads using intuitive web based interface. We recommend using Google Chrome for this task. Please login with default credentials: Administrator username and a blank password. From the main screen select HotSpot web page you want to show the ads, choose Ads type from Content drop-down menu and click Save button. Repeat this procedure for other pages if want them to display ads also. 1. Click Ads button on the top bar, next to home icon. 2. Click New button located under the list of ads. 3. Enter the name in Ad Name field, so you can refer to it inside the Click application. 4. Enable or disable Free Access timer message that is displayed on top of the ad. Disable this option if you don’t want to allow free access to users after they watch the ad. 5. Set Ad Status to active. 6. Select Ad Type, HotSpot Click supports image (.jpg) and video (.mp4, .webm, .ogv) files. After you configure your ads, you can Delete default ads you don’t need or stop them from showing by setting Ad Status to Disabled. If you want to check how the page will look in customer’s browser, click on the home icon and press TEST button. Technical support to get setup fast and easy. Learn the powerful management features. Buy it when you are convinced we are the best. No reinstallation. Keep all your configurations. License is good forever. Free updates until next major release. 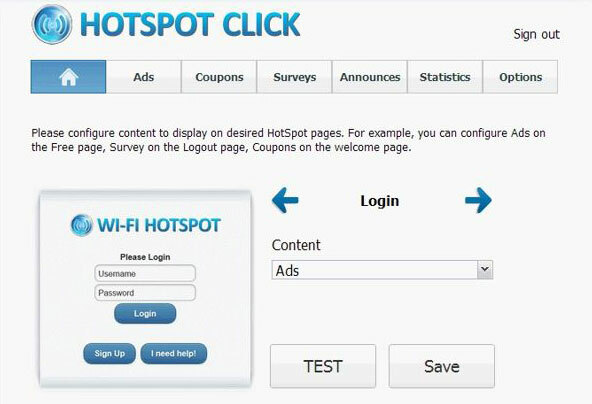 Download Free Trial and Test HotSpot Software Now!